I managed, one or three boards at a time, to get the glue faces of the benchtop boards planed smoothish (from rough-sawn) over assorted weekday evenings in the hour or less that I had free. 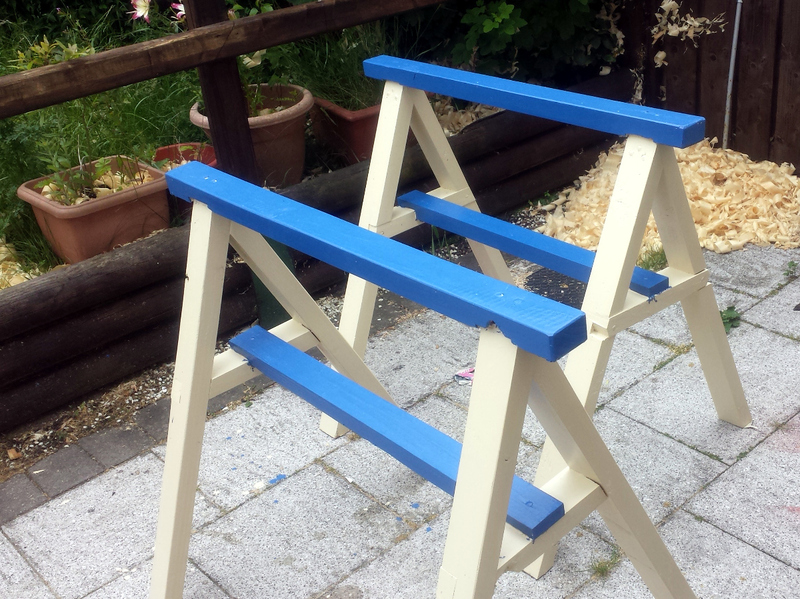 Hell, I even managed to paint the sawhorses out of sheer frustration (and to test the colours of the paint intended for the shed). Got all the grains lined up to help with planing later on, picked out the most awful looking boards for the back of the bench – if I can arrange for the lighting in the shed to be bad enough I won’t even see the knots – and then clamped everything to see where the worst gaps were. Noted them on the boards and then started working through the boards a pair at a time, holding them together with hand pressure, noting the high points on the glue faces, planing them down, re-holding them, swearing, planing some more, rechecking, reswearing… you get the idea. Eventually I got it to the point where the gaps in any pair of boards was eliminated under hand pressure and the clamps eliminated them over the whole top. That’s not the entire top of course, it’s just the core – there are four more boards, two which will have the mortice for the leg tenons cut in them and two which will be the top apron boards. They’ll get added on later. One more dry rehearsal and then out with the titebond. And all of the clamps. 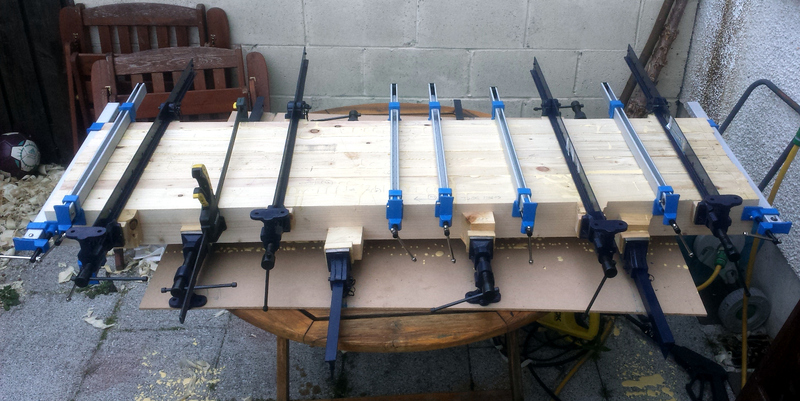 Seriously, I know you can’t ever have enough clamps, but I’m running out of wood to put the clamps on. I did initially put the two ends into cauls to keep them as flat as I could while taking up the pressure on the main clamps, and then removed the cauls and added the clamps I had used on those to the main boards. 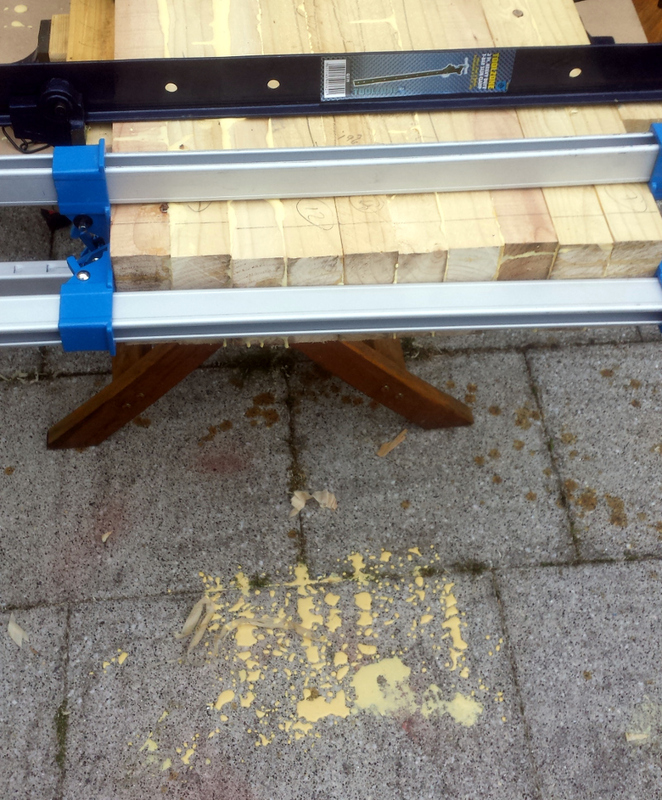 I’ll probably wind up regretting that at some point but the RWD wood not being planed meant all the 2x4s weren’t 2x4s; they were 2x4s, 2×3.9s, 2×4.1s and so on, so I was never going to get away from lots of planing to flatten the top. Might as well just accept that now I guess. Still though, good squeeze-out top and bottom. That’s good. Or at least, that’s what I’m telling myself repeatedly while wondering where a full litre of titebond went to. 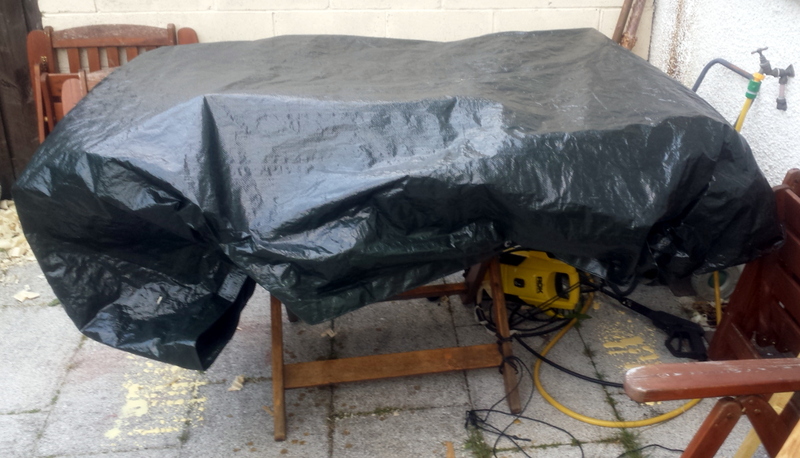 And then I threw a tarp over the whole thing and five minutes later the heavens opened, again. And we’re forecast for a week of rain. Bloody Irish summer weather. I’ll take off the clamps in a few days, see how bad the result is. Oh matron, the suspense!